Sandyford & Goldenhill Residents Association, SAGE held it’s Annual Goldenhill Community Fun Day on Saturday 3rd August. The day proved to be a big hit with everyone from the local community, which included residents from the very young to those who were a little bit more elderly in years. This year the Sandyford & Goldenhill Residents Association (S.A.G.E.) has reached new heights with its Community Fun Day, which is to be held on Saturday 3rd August. 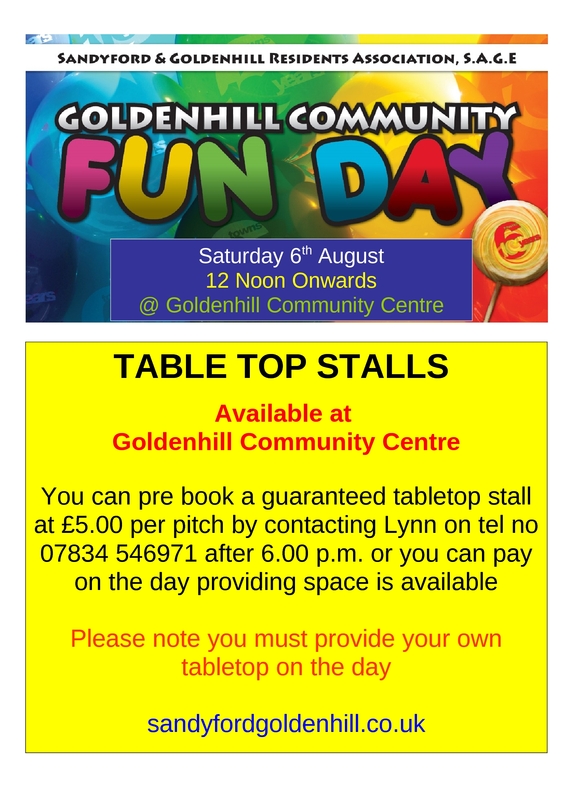 Goldenhill’s Community Fun Day is being held at the Community Hall/Centre from 12.00 noon onwards on Saturday 6th August. The event is showing quite a lot of interest from the local communities of Sandyford & Goldenhill and also further a field. Holiday activities for young people aged between 5 and 11 are to take place over the summer months. The activities, dates, times and venues can be found on the forum page under events and meetings. For further all sports activities, you can contact Mark Roberts on telephone 01782 234993.